The new collaboration between Disney and Pixar Animation Studios, Inside Out, is an endearing, intelligently-written comedy-drama with candy-colored imagination. While Disney-Pixar has been stuck in a bit of a rut in the past few years with mediocre films such as Cars 2, Brave, and Monsters University, Inside Out reminds us of the collaborative strengths that made their earlier films, such as the Toy Story movies and Up, special. These are films children love because of their fun, memorable characters, colors, and engaging stories with themes complex enough to keep adults interested. Inside Out belongs in that same category. Brilliant. Bright. Funny. Imaginative. Profound. Moving. Sometimes sad. All of these adjectives can be used to describe the power of Inside Out, which is easily one of the best films of 2015. Despite the bright colors, artistic settings, and delightfully varied characters, Inside Out may be somewhat of a hard sell for the smallest of children. This is arguably a more meaningful film than any of Disney-Pixar’s previous works, heading deep into psychological regions. The adventure takes place in the human mind and the central characters are emotions—by making it this way, the film explores complex themes of personality. Riley (voiced by Kaitlyn Dias) is an ordinary 11-year-old girl who is forced to move with her parents (Diane Lane and Kyle MacLachlan) from Minnesota to California because of a new job opportunity. She wants to make the best out of this situation, but it only gets worse as the moving truck is lost, the house is a dirty mess, the nearby pizzeria has only one topping (broccoli), and she has trouble fitting in at her new school. It’s difficult for her to be cheerful and upbeat as she misses her friends, her old house, and her hockey team. We see Riley’s world through the emotions in her head, which is where much of the film’s story is told. We meet Joy (Amy Poehler), our green-colored (each emotion has a different color) narrator and Riley’s chief emotion who keeps the other emotions in check so that Riley is consistently happy. The other primary emotions are blue Sadness (Phyllis Smith), purple Fear (Bill Hader), red Anger (Lewis Black), and green Disgust (Mindy Kaling). They run the Control Room inside Riley’s mind, which allows them to see what she sees and for her to feel what they feel. Memories are created and stored in collections of glass spheres, whether they’re short-term, long-term, or forgotten entirely. And there are also theme parks connected with one another, with the themes being dreams, nightmares, her favorite sport (hockey), imagination, and so on. It’s amazing to see how this “world” inside a person’s head works. There’s a dark abyss where forgotten memories are stored and eventually fade away, a dream-land that resembles a Hollywood studio where actors act out Riley’s dreams and nightmares, and all sorts of inventive components. Something goes wrong, as Joy and Sadness are accidentally ejected from the Control Room. With Fear, Anger, and Disgust in charge, Riley, on the outside, snaps at her parents, fears attempts at making new friends, and even considers running away, while Joy and Sadness go on a quest through the craziness of Riley’s subconscious in order for Joy to regain control. They encounter many strange things along the way, including abstractness, fears, daydreams, and even a forgotten imaginary friend, named Bing Bong (Richard Kind). The film shows complication and difficulty in adjusting and other psychological issues in a way that’s basic but also important and relatable. Some little kids may wonder why some of Riley’s worlds such as Hockey Land or Friendship Land are deteriorating, but adults will understand what Riley is going through and what everything on this journey means. With Joy and Sadness gone, Riley’s personality is shutting down, causing her to lose sense of the bright side of life and what it means to express herself. Even her associated memories are fading, adding more depth to the situation. But even if it all goes over kids’ heads, and they’ll understand it more as they get older, they’ll at least get a kick out of the film’s overall visuals. There’s a fascinating dynamic between Joy and Sadness. Joy wants nothing more than for Riley to be happy. Sadness knows nothing but sadness and also has a Midas-like touch, so that every one of Riley’s memories she touches turns blue and sad. But in order to get back to the Control Room, they have to work together. I wouldn’t dare give away how, but something occurs to Joy later in the film about how much Sadness is needed. This leads to a wonderful conclusion that delivers a message about how we can’t always have our happy ending and we just have to deal with what we have rather than what we don’t and it’s important to express yourself. That’s a message you rarely find in especially family films. I applaud this movie for not taking the easy way out. 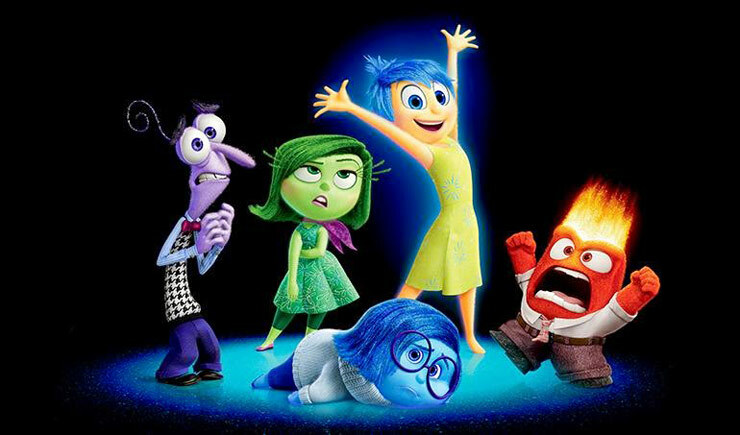 With the perfect balance of comedy and drama, wonderful computer animation, amazing visuals, and a script that knows more about the subconscious than one might expect from seeing the film’s trailer, Inside Out is an instant classic, the best animated film to come around in a long time, and one of Disney-Pixar’s absolute finest.